How can I theme the Views Exposed Filter? I create a view in drupal 7 display a collection of books, and taxonomy for book types .. then I call book type taxonomy in my view and it displayed good .. But because book types taxonomy menu have about 10 items and maybe increased at any time, I want to display 3 items of book types and when click More link display a list of the others, I can't do it in css only, and I can't add a div to group the other part of the list .. so how can I do that? but now how can I group first tow options in a div and remain options in another div or group? Normal Form API procedures then apply. Views exposed form layout module helps with Views exposed form theming. I usually recommend to use the Better Exposed Filters (BEF) module for anything styling related. It gives you a great deal of flexibility concerning UI controlled styling. But if I understand your question right, then you're neither finished with the suggested solutions (form_alter) nor with BEF. The reason is that your exposed taxonomy term filter is probably rendering the filter as a single form element that you can't easily be split into several divs. You could try to do the following, assuming you have, say, 3 "promoted" filters that you always want to show. Then you could add one filter of type taxonomy term, display the filter as checkboxes and limit the valid options to those 3 three "promoted" terms and expose the filter. Then add this same filter again, expose it, but this time limit the valid options to all other terms except the three "promoted" ones. You could then use BEF for example to put this second filter inside the secondary options form (this is a BEF setting) or simply make the filter collapsible (also possible so set in the BEF settings). How to theme the views exposed form? Views - create relationship on relationship? How can I theme the Views Exposed Filter Results page? Could the filter order make a difference? 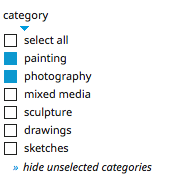 Is it possible to group taxonomy list items by content type?